Ginger beef—the ultimate comfort food. The famous dish consisting of marinated beef deep-fried in batter and coated with a sweet and sour sauce is a staple of Alberta Chinese restaurants. However, it is very difficult to trace the origins of this popular recipe. Does the ginger beef that Albertans know and love represent true Chinese cuisine? For that matter, is ginger beef—no matter how it's prepared—an authentic Chinese dish? A search through several Chinese cookbooks quickly reveals that the idea of marrying beef with ginger is nothing new. For example, in "Ginger East to West," Bruce Cost provides a recipe for "Real Ginger Beef" that is quite different from the typical restaurant version, using a full cup of ginger and two cups of fresh coriander leaves. In "Joy of Wokking," Martin Yan has a recipe for "Spicy Ginger Beef" seasoned with five spice powder. Finally, "Madame Wong's Long-Life Chinese Cookbook" contains a ginger beef recipe that uses preserved red ginger and red pepper, with a sauce made from chicken stock, cornstarch, hoisin sauce, and dark soy sauce. 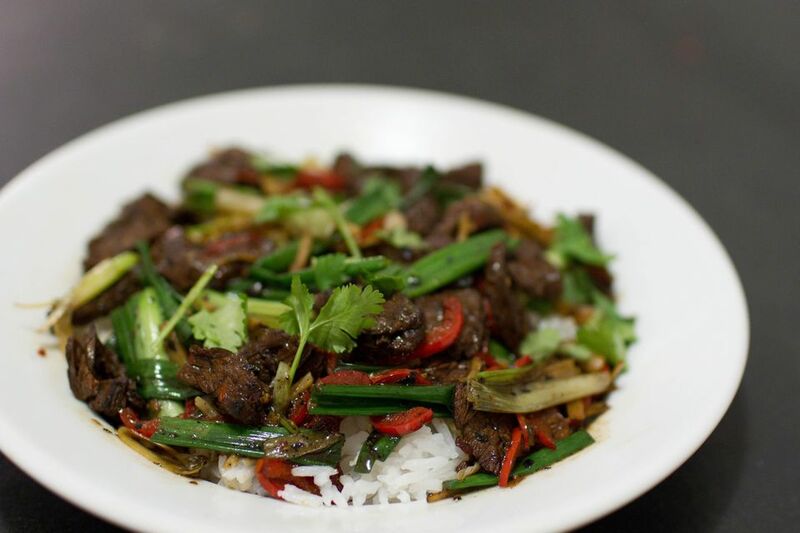 Ginger beef is based on a northern Chinese dish that is much drier and less sweet than the restaurant version. Although his name is lost to history, it is thought that a Chinese chef working in Calgary came up with the crunchy "Americanized" ginger beef with the sweet sauce that is so popular in Alberta. Even today, it is difficult, although not impossible, to find Alberta-style ginger beef outside the province. But whatever its origins, ginger beef is a great way to introduce people to Chinese food. And, while not a dish for calorie-counters, it has the advantage of containing healthy ingredients such as ginger, which is thought to have health benefits. To make it extra crispy, deep-fry the beef twice. This technique is often used in restaurants: staff prepare a batch of ginger beef and set it aside. When a customer places an order, a portion is deep-fried again. To make the ginger beef extra tender, use only cornstarch for the batter (instead of half cornstarch and half flour). Mix the batter thoroughly. Test with chopsticks or a wooden spoon. It should just drop without sticking. Ginger Beef Recipe: Follow this simplified version of the classic recipe. It requires one pound of beef flank steak. The items you'll need that might require a trip to a well-stocked grocery or an Asian market are hot chili peppers, fresh ginger, ginger juice (storebought or homemade), Asian sesame oil, dark soy sauce, light soy sauce, hot chili oil (optional) in addition to usual pantry items. You'll also need four to five cups of oil for frying.